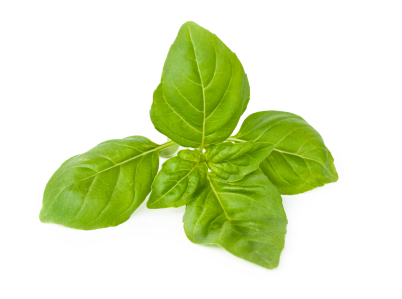 The high notes in this Basil Essential Oil are decidedly herbal if not somewhat harsh. There is however a sweetness due to the natural occurrence of the estragole, methyl chavicol. Basil methyl type oil is useful in the soap industry and may be used in blends calling for sweet basil, with discretion. Experts do not recommend it as a substitute, however, but as a supplement. Recently, there has been much research into the health benefits conferred by the essential oils found in basil. Scientific studies have established that compounds in basil oil have potent antioxidant, anti-cancer, anti-viral, and anti-microbial properties. The health benefits of basil essential oil include its ability to treat nausea, motion sickness, indigestion, constipation, respiratory problems, diabetes, etc. Basil oil is also a good source of Vitamin A, magnesium, potassium, iron, and calcium. Basil oil is also a good treatment for itching from bites and stings from honey bees, insects and even snakes. Other uses include curing motion sickness and vomiting. This oil and basil in any other form should be avoided by pregnant and breastfeeding or nursing women. On the other hand, some people suggest that it increases milk flow.